After 10+ years working in brand design and advertising, we, husband and wife team Alaina & Simon, decided to get our hands dirty and learn some new (old) skills. After a bit of research, discussions and holding out for the right machine, we took the plunge and purchased a 1964 Heidelberg Platen in great condition that had only one previous owner... and with a machine this size, we're lucky to have some experts on hand from our years in the design industry. We like to create, so check out the Millimetre Press Co. store to see projects we have been working on that have been put into production. All prints are limited edition so check back regularly to see whats new. The Millimetre Press Co / Alaina Rhind - Aritist blog. On this new shared blog we will be adding projects we have been working on, upcoming projects and some of our past archived work. The Millimetre Press Co. is all about experimentation, we love to learn new techniques, push the boundaries and mix printing techniques and media. While the majority of our work is centered around limited edition prints, if you have something you would like to talk to us about, give us a call. ABOUT US / MMPRESS CO. The Millimetre Press Co is owned and run by husband and wife team, Simon Courtney & Alaina Rhind. We have both spent years in the design and advertising industry working on a variety of clients, both nationally and internationally. With creativity coming naturally and as a sidecar to our design careers, we have participated in multiple art exhibitions, both here and overseas, while Simon also has a passion for bike building, for which he won the Steinlager Pure futures Grant of 2011. Having always been interested in letterpress and print techniques and wanting to experiment with our passions for design and illustration into another medium, we kept an eye out for letterpress printer and were lucky enough to stumble across a 1964 Heidelberg Windmill that had only one owner. A bit of negotiation later, and with a 2.5 tonne press delivered to our front door, the Millimetre Press was born. Let the experimenting begin! - A Heidelberg Windmill. Made in 1964 and having had only one owner in NZ from new we were excited about the condition and useabililty of the machine. After a trip to view it and organising a 4 hour trip on a rather large truck, the 2.5 tonne machine was delivered to our home and it's space in the garage. While it's rather large and and complicated for the amateur printer, we have never walked away from a challenge and have been gaining knowledge from local printers, various internet resources and the best process of all - practice! We would love to add other machines and are always on the lookout, but are working hard to master this beast first. Keep an eye on the blog, Alaina is off to NYC this October for some letterpress tuition and to print some new editions. 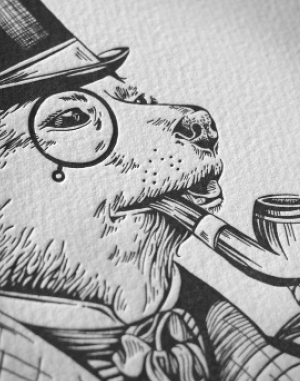 As well as design and letterpress Alaina has a talent for illustration producing custom portraits, limited edition prints and commissioned artworks. You can find some examples of current and past work on the blog and coming soon to a newly revamped website (both coming soon). If you have something you would like to discuss or to stock any work please contact Alaina here. While you can find some examples of own work of custom branding, design and typography here, Alaina and Simon also work for two Creative agencies in Christchurch. If you have something you want to talk to us about - whether it is big or small, we have the resources to help you. Simon's passion for bikes extends into the Millimetre Bicycles brand. While Simon has been perfecting this craft for the last few years, these limited edition, hand-made bicycles will be available from mid-2016. You can keep up to date with his progress on the blog or email us for more information. Want to talk, get in touch with us!